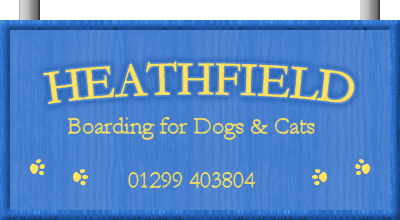 Welcome to the website of Heathfield Boarding of Bewdley, cattery and dog boarding kennels in Worcestershire you can trust with the welfare of your beloved pets. 9.00 a.m. - 11.00 a.m. and 3.00 p.m. - 5.00 p.m.
9.00 a.m. - 11.00 a.m.
Christmas Eve, Christmas Day, Boxing Day, New Years Eve, New Years Day. Both Gillian and David Bell have owned and personally run Heathfield Boarding Kennels since 1989 and have nearly 40 years' experience in breeding Championship-winning Irish Setters and Labradors. Charlotte Johnson has been our 'Head Girl' for 16 years and is NVQ-qualified in Animal Management. A collection service is available on application. For cat boarding kennels or dog boarding kennels in Bewdley or Worcestershire, contact Heathfield Boarding today for peace of mind at the best value.